Isolalunga is an ideal starting point for hiking and biking in the Prino Valley. Besides, you can also embark on wonderful day excursions into the hinterland from here, because the small paths are very suitable for hiking and bike tours of every nature. If you prefer to simply relax, you can go and spend an evening in “Bar Lume” and try out some regional specialties like olives, wine and lots more. It is not for nothing that this village was named Isolalunga: “Il sola lunga” - “The long sun”. The village is blessed with warm sunshine all day long. Isolalunga lies on the eastern slopes of the Prino valley and the sun’s rays extend over the entire village. Isolalunga is a typical mountain village; like many other small mountain villages the houses are lined close to one another. In those early days this arrangement served the purpose of protecting the inhabitants from pirates. The old lanes have a certain special flair of their own and they beckon you to take a stroll around. The picturesque houses made of natural stone, the beautiful panorama and the pleasant tranquillity of the place are all very characteristic of Isolalunga as a village. The sea and the beach can be reached in just a few minutes’ time by car from Isolalunga. 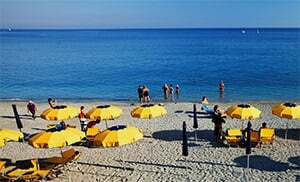 Besides, one can set out from here for some wonderfuly day excursions to the neighbouring cities like Imperia or Sanremo . 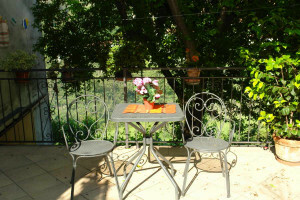 If you like rummaging through weekly markets, you should absolutely not miss one in Oneglia. Isolalunga is a suburb of the town of Dolcedo and it lies on the eastern slopes of the Prino valley. The village was settled by human populations during the early Middle Ages, and was made part of the municipality of Dolcedo in the 12th century. The closely-knit stone houses served the purpose of protecting the village from pirates; like many other coastal villages, Isolalunga was namely also frequently attacked by pirates in the Middle Ages. Isolalunga belongs to the municipality of Dolcedo and is one of the villages in the province of Imperia which lies in the Liguria region. There are several other villages near Isolalunga and they include: Torrazza (5.1 km), Bellissimi (5.1 km) and Caramagna Ligure (4.5km). When coming from Genoa, take the highway exit to Imperia Ovest and then drive along Via Tommaso, and Littardi Street up to Colla, then follow SP41 up to Isolalunga.